Happy Feet, er, New Year… | carpe diem! Actually completed on Christmas Eve eve. I did a twiddle at the beginning of the ribbing, using M1s and P2tog to split the K2P2 ribbing evenly into K1P1, then cabled the resulting single ribs to make a band a little tighter than the ribbing, just to hold it more firmly. I like the look, but the jury is still deciding whether or not it has any effect on the fit. The majority verdict on the socks overall is ‘good, but could be better’. They’re a fraction too big in the foot, but all the others I’ve knitted tightened up in the first machine wash, so I think that will be ok (I can’t do anything about the fact that his left foot is 1/2″ shorter than his right, or rather I can, but it’s not worth the pain). He’s not sure about the way the thick heelflap catches as he puts his shoes on, but that might just be the novelty. I’ll have to do a standard short-row heel with added gusset next for comparison. I do like the way the large gusset (22st/side) has prevented any hint of tightness in the instep: just look at the even expansion of the ribbing as it climbs the slope to the leg. Sometimes our age shows itself in peculiar ways. One is that we reserve long-distance phone calls for Christmas and birthdays, a reminder of the days when international calls cost seriously large sums of money. It’s always pleasant to hear familiar voices (in one or two cases, the distance adds to the pleasure), but this year I particularly enjoyed a conversation with my niece that began “It’s all YOUR fault!” What had I done? Well, she’d been a bit taken aback to find that the soundtrack for the Christmas family get-together was the sound of clicking knitting needles. My mother-in-law is not only still knitting, she’s just finishing her first pair of toe-up socks. 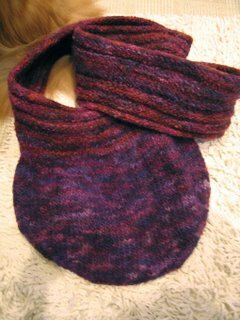 My sister-in-law was knitting something else, but was so impressed by MiL’s work that she’s going to start sock-knitting in the New Year. I’m sending them each a set of Addis for socking on two circulars and in return I’m getting Socks That Rock sockyarn! Sounds good to me… and I’m sure my niece can learn to live with it. Perhaps the gift of a shawl would help. She was absolutely adamant that I wasn’t going to start her knitting (she’s quite happy quilting, thanks). Another FO: our bedroom floor. This means he’s hand-sanded every inch of the upstairs floor at least twice, scouring away the dirt and old paint with coarse and fine paper, but leaving the worn shape of the boards intact. 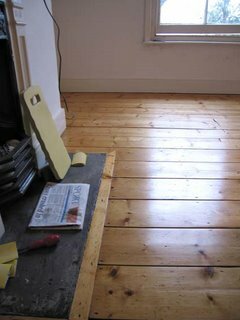 Room by room the floors have been sanded, oiled twice, and then I apply a hand-made wax (beeswax, carnauba and turpentine) which is then polished to a satin finish. It’s been a bit of a knee- and back-killer, but the finished rooms are lovely: white walls, white woodwork, all warmed by the golden glow from the floors. Anyway, the floods have been cured, and he’s back to decorating. Did I mention the bit where my mad dash to town to buy the paint ended in the discovery that our favourite supplier closed early for Christmas? Never mind, the room looks wonderful now and will look even better when seen from clean sheets on a real bed. 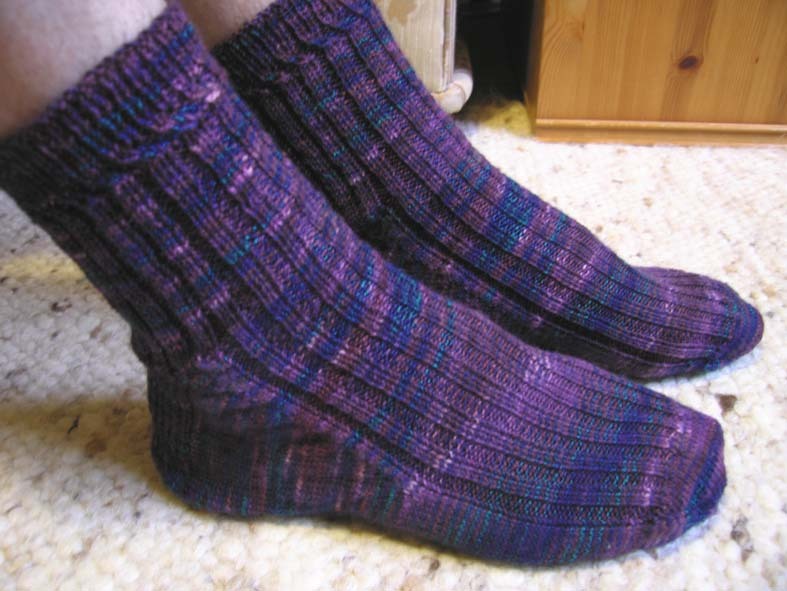 I was going to cast on for Eunny’s intricate Endpaper Mitts for me when I finished his socks. I’d even bought some Jamieson’s Shetland 2-ply for that very purpose. In fact I did cast on, twice, and the Italian tubular cast-on defeated me twice. I’ll practice it with something smoother, more inclined to co-operate when I try to pull it out from the middle of the tube. Mind you, even the bits from which I’d extracted it didn’t look smooth and tubular. Feeling disgruntled, I looked for another gruntle in the stash and found some Manos I’d bought in Canada for a Cat Bordhi moebius bag to replace the one my Pilates friend bought off my back earlier this year. Cast on, knitted like mad, felted this afternoon: I have a new gruntle. Much better. Now I can honestly wish all of you – the entire multiverse – a very happy New Year, this year and always. This entry was posted in Uncategorized on December 29, 2006 by sarahw. Happy New Year to you, too! Your floors are gorgeous. I feel your floody pain. We’re still living with a ceiling stained from an old flood. We hope to have it painted when we move out.Your socks and bag are lovely. I hope peace and clean linens and a real bed greet you in 2007. Too bad the cats won’t have the jungle gym anymore, but so much the better for you! Love the socks and the floors and the imagery of cats glissading! Here’s to pipes that hold and socks that fit just right in ’07. I really like that twist effect on the socks – I noticed it right away and wondered what you did. Cool!Your floor looks beautiful. I will show it to Nick – that is what a floor should look like (you should see our attempt at this in our bedroom). Do you know anything about getting sunk-in dirt off a previously beautiful parquet floor (the hall)? Sorry to hear of your woes with the leak. Our dining room ceiling crashed in once, when the tank in the loft overflowed and fell through two floors. So I suppose yours could have been worse (we weren’t yet living here – it was just before we moved in).HAPPY 2007 Sarah! Your floors are just beautiful! When it is all done and put back you are going to feel like a queen in your rooms. The cats too!I’m so sorry to hear about your flood. That is horrible. At least it didn’t ruin your Christmas. Our basement fills with water during heavy rainstorms despite multiple repairs, so I do know what you are talking about!! The socks and bag are great — amazing that you kept knitting despite all the excitement! Happy 2007 to you and your family.